The main question we get from potential customers is: How do I buy a trampoline?! With so many different prices, shapes, brands and warranties on the market, it can be difficult to know where to start. You may find that many different companies promise the same quality products, but do not offer the same result. The endless sales pitches and brochures of information can be confusing if you don't know what to look for. Read on to make sure you know what to consider when buying a trampoline. Will the trampoline be used indoors or outdoors? This will determine the size of the trampoline you need. How old will the users be? Safety considerations and the size of your trampoline will depend largely on the size of the children (or adults) using it. Are the users still growing? You don't want to be replacing your trampoline as often as you replace your children's shoes! So make sure you take their growth into consideration. What diameter is most suitable for the users? Older users are going to need a slightly bigger bounce, and more space to bounce in. Which trampoline will best fit your backyard? As much as we'd all love a 14ft trampoline to jump on, our backyards don't often allow for one. Unfortunately, space is a major consideration when purchasing a trampoline – but we have a trampoline for every space, just visit our website. Determine the profiles of your main users of the trampoline and devote some time to researching the most durable trampoline materials. Extensive knowledge is the key to getting a quality trampoline at a reasonable price! How will your trampoline be used? - Will the trampoline be used indoors or outdoors? How old will the users be? Are the users still growing in size? What diameter is most suitable for the users? What size trampoline can my backyard fit? - Determine the profiles of your main users of the trampoline and devote some time to researching the most durable trampoline materials. Extensive knowledge is the key to getting a quality trampoline at a reasonable price! A trampoline's frame should be sturdy and strong. Not only does it need to support its own weight, it also needs to support the weight of a bouncer. Look for frames with solid foundations, galvanised steel parts and well considered joins prior to purchasing a new trampoline. If the frame is not galvanised inside, water may seep through a joint or hole to the inside of the frame. The reaction of the iron and oxygen forms corrosion, which will quietly form on the inside and slowly weaken the structure. 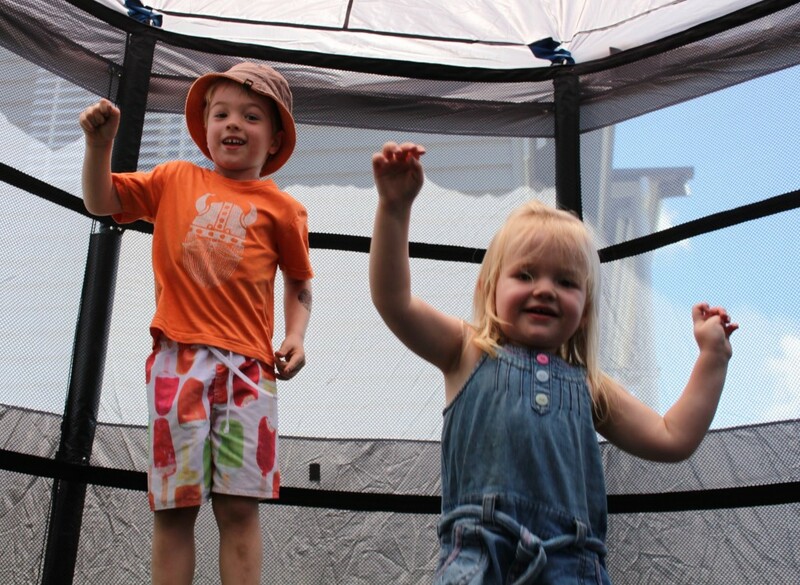 All Vuly Trampolines are durable, safe, and the strongest trampolines on the market. Trampoline jump mats are another crucial safety component in any trampoline. Like those used on all Vuly models, higher quality mats have a glossy appearance, feel smooth to touch and are far less likely to cause friction burn under normal use. Jump mats should be highly UV and water resistant for a lasting performance. Low-quality mats can be coarse and can produce abrasions that are similar to carpet burns. They are prone to degrading and can leave particles on the bodies and clothes of jumpers. If the mat easily rubs off, the potential customer should realise that the mat is either a poor quality component or that the mat has a manufacturing defect. Safety padding is crucial to protect the users from the springs and trampoline hardware. Without this component, your family may be at risk for potentially serious injury. You should always look for soft, durable, and highly-breathable safety padding so water does not damage the internal components. Also look out for thick closed-cell foam material inside the pads and UV/water-resistant exteriors. The most effective external material available on the market today is Polyvinal Choride (PVC). Trampolines for sale are often portrayed as being "cheap" or "the best bargain". Trampolines provide great physical benefits, but please be wary of second-rate materials. Conventional wisdom sensibly suggests that you get what you pay for --- and you don't want poor quality devices that rely on flimsy construction and inferior components. A massive sale or drastic markdown in the price of trampolines leads to you wondering about the potential downfalls. Why has this model been marked down? Was it a popular item when it was full-priced? What materials make up your trampoline components? Do you have comprehensive warranty? Carefully note the sales representative's extent of trampoline knowledge and his or her ability to thoroughly answer questions. If their responses are unclear or they cannot tell you the basic benefits of the materials used, it is quite likely that the company does not specialise in quality trampolines. The markdown might be a sales ploy to give the item an air of rarity to encourage customers to capitalise on the sale --- remember, a sale does not necessarily mean that the customer is getting a good deal!